Besides few data concerning the antiseptic properties against a range of microbial agents and the anti-inflammatory potential both in vitro and in vivo, little is known about the influence of Eucalyptus oil (E O) extract on the monocytic/macrophagic system, one of the primary cellular effectors of the immune response against pathogen attacks. The activities of this natural extract have mainly been recognized through clinical experience, but there have been relatively little scientific studies on its biological actions. Here we investigated whether E O extract is able to affect the phagocytic ability of human monocyte derived macrophages (MDMs) in vitro and of rat peripheral blood monocytes/granulocytes in vivo in absence or in presence of immuno-suppression induced by the chemotherapeutic agent 5-fluorouracil (5-FU). 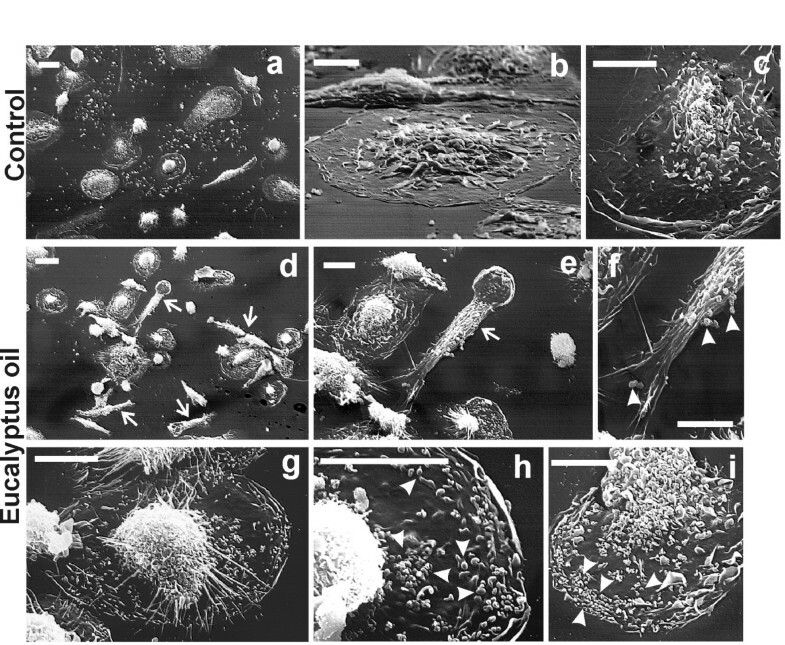 Morphological activation of human MDMs was analysed by scanning electron microscopy. 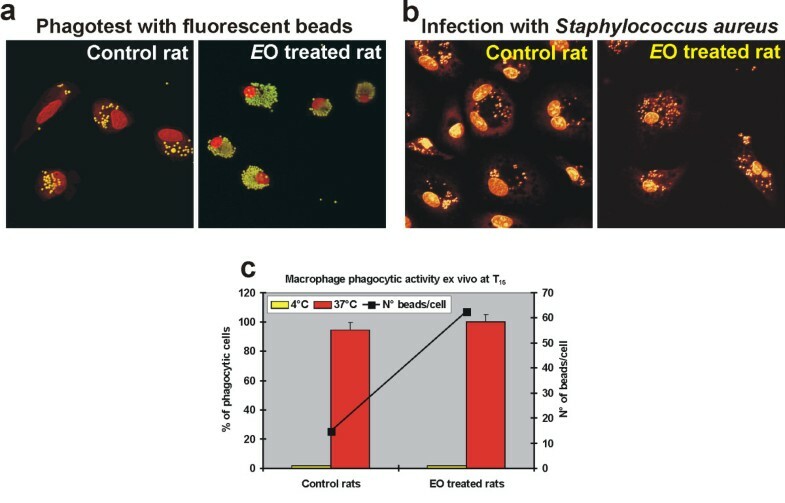 Phagocytic activity was tested: i) in vitro in EO treated and untreated MDMs, by confocal microscopy after fluorescent beads administration; ii) in vivo in monocytes/granulocytes from peripheral blood of immuno-competent or 5-FU immuno-suppressed rats, after EO oral administration, by flow cytometry using fluorescein-labelled E. coli. Cytokine release by MDMs was determined using the BD Cytometric Bead Array human Th1/Th2 cytokine kit. E O is able to induce activation of MDMs, dramatically stimulating their phagocytic response. E O-stimulated internalization is coupled to low release of pro-inflammatory cytokines and requires integrity of the microtubule network, suggesting that E O may act by means of complement receptor-mediated phagocytosis. Implementation of innate cell-mediated immune response was also observed in vivo after E O administration, mainly involving the peripheral blood monocytes/granulocytes. The 5-FU/EO combined treatment inhibited the 5-FU induced myelotoxicity and raised the phagocytic activity of the granulocytic/monocytic system, significantly decreased by the chemotherapic. Our data, demonstrating that Eucalyptus oil extract is able to implement the innate cell-mediated immune response, provide scientific support for an additional use of this plant extract, besides those concerning its antiseptic and anti-inflammatory properties and stimulate further investigations also using single components of this essential oil. This might drive development of a possible new family of immuno-regulatory agents, useful as adjuvant in immuno-suppressive pathologies, in infectious disease and after tumour chemotherapy. The monocytic/granulocytic system as well as differentiated macrophages constitute the primary cellular effectors of the immune response, playing a pivotal role in the detection and elimination of foreign bodies such as pathogenic microorganisms. Recognition of foreign microorganisms by these cells ultimately results in phagocytosis and in the eventual destruction of pathogens by lysosomal enzymes. Macrophages perform a variety of functions other than phagocytosis . The phagocytic process is accompanied by intracellular signals that trigger cellular responses such as cytoskeletal rearrangement, alterations in membrane trafficking, activation of apoptosis, release of chemical mediators such as growth factors, pro- and anti-inflammatory cytokines and chemokines . Such mediators, produced by activated macrophages, are essential for microbe killing but also potentiate inflammatory reactions; thus regulation of this production is therefore critical to kill pathogens without inducing tissue injury . Natural oils are extensively used in cosmetics as well as in folk medicine for the treatment of a growing number of more or less specific pathologies. Recently the clinical use of essential oils has expanded worldwide also including therapy against various kinds of inflammatory diseases, such as allergy, rheumatism and arthritis. These activities have mainly been recognized through clinical experience, but there have been relatively little scientific studies on biological actions of these natural extracts. For instance, the tea tree oil as well as Eucalyptus oil have been demonstrated to possess antiseptic properties against a range of bacteria [4–8] and have been used in a number of products against oral pathogens and different forms of infections. It has also been suggested that tea tree [9, 10] and lavender oils  are able to suppress allergic symptoms through the inhibition of histamine release [12, 13] and cytokine production  in in vitro and in vivo. Monoterpenoid components of aromatic constituents of Eucalyptus oil are traditionally used as analgesic, anti-inflammatory, and antipyretic remedies and are commercially available for the treatment of the common cold and other symptoms of respiratory infections. Phytochemical analysis has shown that the profile of the monoterpenoids changes among the Eucalyptus species, with potential variations in therapeutic properties. In Eucalyptus globulus, the major monoterpenoid component is eucalyptol (1,8-cineole), constituting the 60–90% , that has been reported to inhibit the production and synthesis of tumour necrosis factor-α (TNF-α), interleukin-1β (IL-1β), leukotriene B4, and thromboxane B2 in human blood monocytes [15, 16]. An anti-inflammatory activity of eucalyptol in patients with bronchial asthma has been also described in a double-blind, placebo-controlled trial . These findings provide scientific support at least for some of the traditionally accepted uses, in folk medicine, of essential oils, and in particular of Eucalyptus oil, although a direct relationship is still to be demonstrated. To our knowledge, actually there are no available data concerning the influence of Eucalyptus essential oil on the cellular components of the immune system, the only exception is for the effect on some cytokine production [15, 16]. The aim of the present study has been to investigate whether essential oil from Eucalyptus globulus (E O) is able to affect the phagocytic activity of human monocyte-derived macrophages (MDMs) in vitro and of peripheral blood monocytes/granulocytes from immuno-competent rats treated in vivo in absence or in presence of immuno-suppression induced by administration of the chemotherapeutic agent 5-fluorouracil (5-FU). E O treatment, at both concentrations used in our experiments, did not affect the macrophage viability, as revealed by the Trypan blue exclusion method (see Additional file 1). Morphological observation of human MDMs (Fig. 1) showed that after 24 h treatment with 0.008% or 0.016% EO, cells assumed the typical activated morphology, also exhibited by LPS-activated MDMs, showing an enlarged size, more abundant microvillous structures as compared to the untreated macrophages, a rougher surface with prominent filopodia, blebs, and rufflings. Confocal microscopic observation, after fluorescent beads administration to cell cultures (Fig. 2), showed that E O is able to dramatically increase, in a dose dependent manner, the phagocytic activity of MDMs, to higher extent compared to the LPS treatment. In fact, as reported in Fig. 2h, in untreated control cultures 13.7% of cells were phagocytic, with a mean of 11 beads phagocytosed per cell. In cultures treated for 6 h with LPS, the percentage of phagocytic cells is lightly increased (18.26%), while no increase were recorded in the mean number of beads/cell. Conversely, in sample 24 h treated with 0.008% E O, the percentage of phagocytic cells increases to 27.1% and the average number of phagocytosed beads/cell raises to 24. The treatment with the highest concentration of E O (0.016%), increased so dramatically the phagocytic activity of MDMs, showing up to 64.8 phagocytosed beads/cell, that the majority of cells engulfed with indigestible beads possibly died, leading to a registration of only 10% of phagocytic cells. Moreover, pre-treatment with E O 24 h before the addition of LPS to cell culture was able to increase, without any cytotoxicity and in a dose-dependent manner, the phagocytic activity of human MDMs in comparison with the treatment with LPS alone (Fig. 2j). Morphological features of human MDMs after 24 h of in vitro treatment with Eucalyptus oil. a-f, phase-contrast microscopy after Wright Giemsa staining: a, d, untreated control; b, e, MDMs stimulated with 0.1 μg/ml of bacterial lipopolysaccharide (LPS); c, f, MDMs treated with 0.016% Eucalyptus oil; a, b, c, original magnification: 20×;d, e, f, original magnification: 40×. g-l, Scanning electron microscopy of untreated (g, j), LPS treated (h, k) and Eucalyptus oil treated MDMs (i, l). Bars: 20 μm. In vitro effect of Eucalyptus oil treatment on phagocytic activity of human MDMs. The phagocytic activity of treated and untreated MDMs was tested by adding to cultures 2 × 107 beads/ml of fluorescent polystyrene beads as described in Methods. a-g, confocal microscopy images, showing the beads uptake (yellow-green hue) in control (a, b), LPS treated (c, d) and E Otreated MDMs (e-g); cells were counter-stained with 1 μg/ml propidium iodide (red hue). a, c, e, Original magnification: 40×; b, d, f, g, original magnification: 100×. h, j, Evaluation of phagocytic activity performed counting the number of phagocytic MDMs, reported as percent of phagocytic cells (solid bars), as well as the number of beads per cell (■). A minimum of 500 cells per sample were observed. Evaluation of percentage of phagocytic cells in controls maintained at 0°C, to block beads internalization, is also reported (yellow solid bars). We excluded a non specific effect on macrophage phagocytic activity caused by the oil preparation, by testing other two oil extracts, Lavender oil (Lav O) and the Tea Tree oil (TeaTree O) in parallel with E O. The results obtained (see the Additional file 2), showed that treatment with both Lavender and Tea Tree oil extracts do not affect MDMs phagocytic activity, also confirming the dose-dependent stimulatory effect of Eucalyptus oil. Cell viability (see the Additional file 3) showed that Lav O, similarly to E O, resulted not toxic, indicating that the lack of the effect on MDMs phagocytic ability observed is not ascribable to oil cytotoxicity. Instead, a moderate effect on cell viability of the TeaTree O extract has been recorded. Scanning electron microscopy observation showed, after beads addition to E O treated cultures, the presence of numerous polarised cells exhibiting elongated lamellopodia and filopodia (arrows in Fig. 3d, e), indicative of a pseudopodial activity. 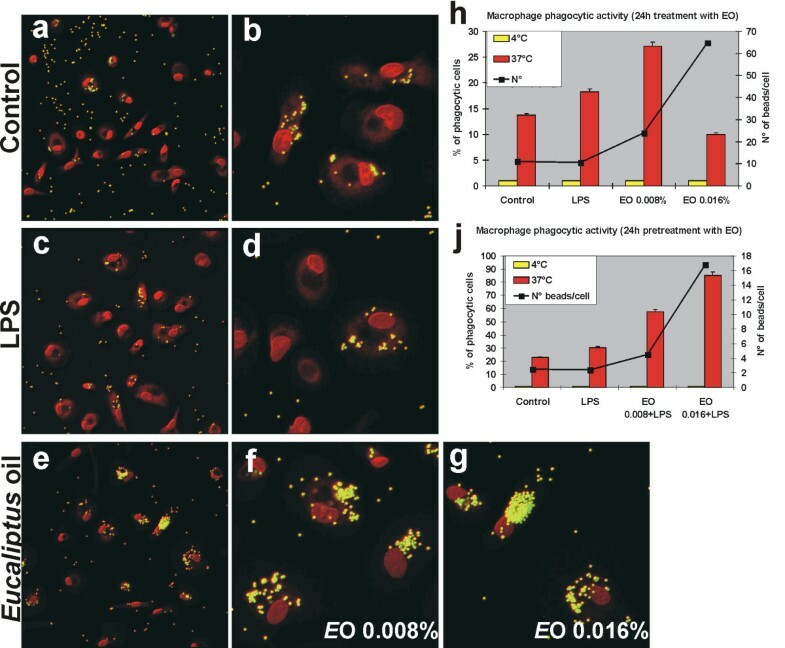 In cell cytoplasm of the E O activated MDMs, a higher number of phagocytosed beads (arrowheads in Fig. 3f, h, i), compared to the untreated control (Fig. 3c) were observed, also distributed at the filopodial and lamellopodial structures, suggesting that an active cell motility might contribute to the increased phagocytic ability towards the foreign bodies. Morphological features of 24 h E O treated human MDMs after in vitro administration of polystyrene beads. Scanning electron microscopy of untreated (a-c) and 0.008% Eucalyptus oil treated MDMs (d-i) showing the presence, in E O treated cultures, of numerous polarised cells exhibiting elongated lamellopodia and filopodia (arrows in panels d and e), indicative of a pseudopodial activity. Arrowheads in panels f, h, i point to phagocytosed beads, more numerous respect to the untreated control (c). Bars: a, d = 20 μm; remaining panels = 10 μm. 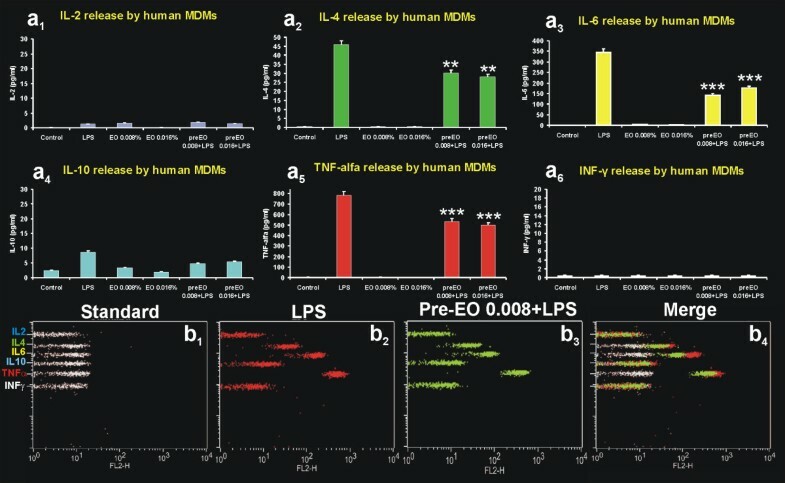 In spite of the morphological features typical of activated macrophages, and of the increased phagocytic ability acquired by E O-treated or pre-treated MDMs, the release in the extracellular medium of pro-inflammatory and immune-modulating cytokines was significantly lower compared to that recorded for LPS treatment alone (Fig. 4). This effect is particularly evident for the pro-inflammatory cytokines conspicuously produced by MDMs under LPS stimulation, such as IL-4, IL-6 and TNF-α. In detail, in absence of LPS stimulation, E O activated macrophages produced very low levels, comparable to the untreated control, of IL-4, IL-6 and TNF-α (Fig. 4a2, a3, a5). Moreover, in accordance with the anti-inflammatory properties ascribed to E O, pre-treatment with E O 24h before the addition of LPS to cell culture was able to significantly decrease the LPS-induced cytokines production (Fig. 4a2, a3, a5, b). No significant effect on the production of the other immune-modulating cytokines tested (IL-2, IL10 and IFNγ) was recorded for both E O or LPS treatments (Fig. 4a1, a4, a6). Th1/Th2 cytokines produced by human MDMs after 24 h of in vitro treatment with Eucalyptus oil. a, Analysis by cytometric bead array of IL-2 (a1), IL-4 (a2), IL-6 (a3), IL-10 (a4), TNF-α (a5), and IFN-γ (a6) production in untreated controls, LPS stimulated MDMs and cells treated with 0.008% and 0.016% E O or pre-treated with E O before LPS stimulation. b, Cytofluorimetric dot plots showing the modification of cytokines profile in culture medium of MDMs LPS-stimulated (b2) or pre-treated with E O before LPS stimulation (b3); b4, merged dot plot showing the decrement in IL-4, IL-6 and TNF-α concentration induced by E O pre-treatment; b1, cytokines profile in standard. **P <0.001 vs LPS stimulation; ***P < 0.0001 vs LPS stimulation. We also investigated whether the observed differences in LPS- or E O-induced internalization and cytokine production were associated with differences in the cytoskeletal elements that mediate phagocytosis. In particular, we verified if the phagocytic ability of LPS- or E O- stimulated MDMs required integrity of the microtubular network. To this purpose, control cells and macrophages, pre-treated with LPS or E O, were treated with the microtubule-destabilizing agent nocodazole and the phagocytic ability was tested after fluorescent beads administration. Confocal microscopic observation (Fig. 5) showed that, after damage of the microtubular network by nocodazole treatment (Fig. 5c), while controls and LPS-stimulated MDMs were still able to internalize beads (Fig. 5d1, d2), in E O-stimulated cells bead uptake was almost completely inhibited (Fig. 5d3). These results clearly suggest that LPS- and E O-induced phagocytosis occur possibly by means of different mechanisms, since only the E O-stimulated internalization requires integrity of the microtubule network. Effect of microtubule destabilization by nocodazole on phagocytic activity of Eucalyptus oil stimulated human MDMs. a, d, Confocal microscopy images, showing the beads uptake (yellow hue) in control (a1, d1), LPS pre-treated (a2, d2) and E O pre-treated MDMs (a3, d3), in absence (a) or in presence (d) of nocodazole treatment; cells were counter-stained with PI (red hue). Merged images with differential interference contrast, used to visualize cell morphology, are shown. b, c, Confocal microscopy images, showing the microtubular network (green hue) in nocodazole treated and untreated cells: b1, c1, controls; b2, c2, LPS pre-treated MDMs; b3, c3, E O pre-treated MDMs. Moreover, as shown in Fig. 5b, E O stimulation is able to provoke a more dramatic reorganization of microtubular filaments respect to LPS, strongly suggesting that tubulin plays an important role in the E O-induced macrophage activation. We firstly assessed the effect of E O on peripheral blood mononuclear cells (PBMCs) after in vivo administration to immuno-competent animals, following the scheme of treatment reported in Fig. 6a. The evaluation of haematological parameters at T15 revealed that E O treatment was able to significantly increase the percentage of circulating monocytes in peripheral blood of treated rats compared to the untreated controls, while no significant modification in the percentage of circulating granulocytes and lymphocytes was evidenced (Fig. 6b). 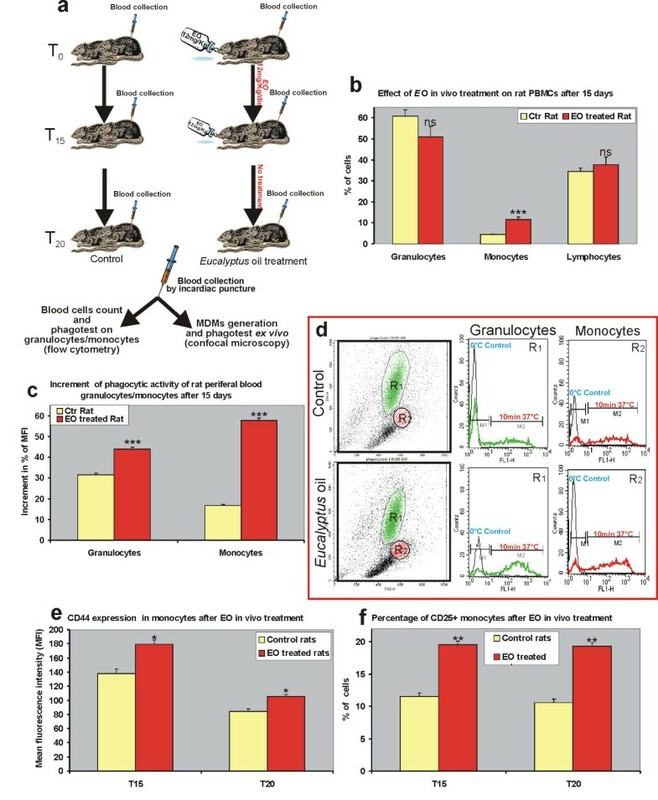 Concomitantly, an increment in the phagocytic activity of granulocytes, and at higher extent of monocytes, obtained from treated animals, was recorded (Fig. 6c, d). In vivo effect of Eucalyptus oil on activity of peripheral blood mononuclear cells from immuno-competent rats. a, Schematic diagram of rats treatment, detailed in Methods. b, Evaluation by flow cytometry of the percentage of circulating granulocytes, monocytes and lymphocytes in untreated control (yellow solid bar) and in rats after 15 days of E O administration (red solid bars). c, d, Cytofluorimetric evaluation, by phagotest kit, of phagocytic activity of granulocytes and monocytes from untreated control (yellow solid bar) and from rats after 15 days of E O administration (red solid bars). The number of internalized bacteria has been recorded as Mean Fluorescence Intensity (MFI): mean values of 12 animals/group are reported as percent of increment of MFI at T15 respect to T0. Representative plots (d) of untreated controls and Eucaliptus oil treated animals are also shown; R1: granulocyte population, R2: monocyte population; phagocytic activity in controls maintained at 0°C, to block E. coli bacteria internalization, is also reported (grey lines). e, Cytofluorimetric analysis of expression of CD44, reported as MFI, in treated and untreated rats at the end (T15) and after 5 days from the end of E O administration (T20). f, Cytofluorimetric evaluation of percentage of CD25+ monocytes in treated and untreated rats at T15 and at T20. *P < 0.01 vs control; **P < 0.001 vs control; ***P < 0.0001 vs control; ns = P not significative. We also examined the monocytic/granulocytic fraction for the expression of surface molecules that may be indicative of leucocytes activation. In particular we evaluated the expression of CD44, the receptor for the extracellular matrix component hyaluronan that mediates the leukocyte/endothelial interactions leading to extravasation , and of CD25, a marker of circulating monocyte activation [19, 20]. Cytofluorimetric analysis showed that at T15 E O treatment induced a significant increase of the expression of CD44, as well as the percentage of CD25+ cells in circulating monocytes compared to the untreated control rats, and this effect also persisted at T20, after 5 days from the end of E O administration (Fig. 6e, f). No significant modification in the expression of CD44 or in the percentage of CD25+ cells was evidenced in circulating granulocytes and lymphocytes (not shown). Ex vivo evaluation of the phagocytic activity of monocytes derived macrophages (MDMs) obtained from treated and untreated animals at T15, revealed that the stimulatory effect recorded in circulating monocytes was also retained in differentiated macrophages (Fig. 7a, c). The ex vivo phagocytic ability of MDMs obtained from E O treated rats was increased not only towards a non-specific foreign bodies such as fluorescent beads, but also towards microbiological pathogens, as observed after infection with Staphylococcus aureus (Fig. 7b). Ex vivo evaluation of the phagocytic activity of MDMs obtained from E O treated and untreated rats. Confocal microscopy images showing the uptake of fluorescent beads (a) or of S. aureus bacteria (b) by MDMs obtained from E O treated and untreated rats at T15; (b) S. aureus bacteria were visible in cell cytoplasm after PI staining; original magnification: 100×. (c) Evaluation of phagocytic activity of rat MDMs performed ex vivo counting the number of phagocytic MDMs, reported as percent of phagocytic cells (solid bars), as well as the number of beads per cells (■). The percentage of phagocytic cells in controls maintained at 0°C, to block beads internalization, is also reported (yellow solid bars). Finally we verified whether E O treatment could be also able to induce a recovery of peripheral blood mononuclear cells activity after bone marrow suppression induced by 5-fluorouracil (5-FU), a chemotherapeutic agent extensively used in the treatment of different types of cancer [21, 22] producing myelotoxicity as side effect . The schematic diagram of treatment is reported in Fig. 8a. The evaluation of haematological parameters at T15 revealed that E O treatment was able to induce a recovery of the percentage of circulating granulocytes that was significantly reduced by 5-FU treatment, while no modification was recorded in the percentage of circulating monocytes, that, on the other hand, was not influenced by the chemotherapeutic agent (Fig. 8b). In vivo effect of E O on activity of peripheral blood mononuclear cells from 5-FU immuno-suppressed rats. a, Schematic diagram of rats treatment, detailed in Methods. b, Evaluation at T15 of the percentage of circulating granulocytes and monocytes in untreated control (yellow solid bar), in 5-FU immuno-suppressed rats (cyan solid bar) and in rats after 5-FU/E O combined administration (red solid bars). c, d, Cytofluorimetric evaluation of phagocytic activity of granulocytes (c) and monocytes (d) from untreated control, 5-FU immuno-suppressed rats and rats after 5-FU/E O combined administration; the percentage of phagocytic cells (solid bars), as well as the MFI (■), indicative of the number of internalized bacteria/cells, are reported. e, Evaluation of phagocytic activity of rat MDMs performed ex vivo counting the number of phagocytic MDMs, reported as percent of phagocytic cells (solid bars), as well as the number of beads per cells (■). *P < 0.01; **P < 0.001; ns = P not significative. 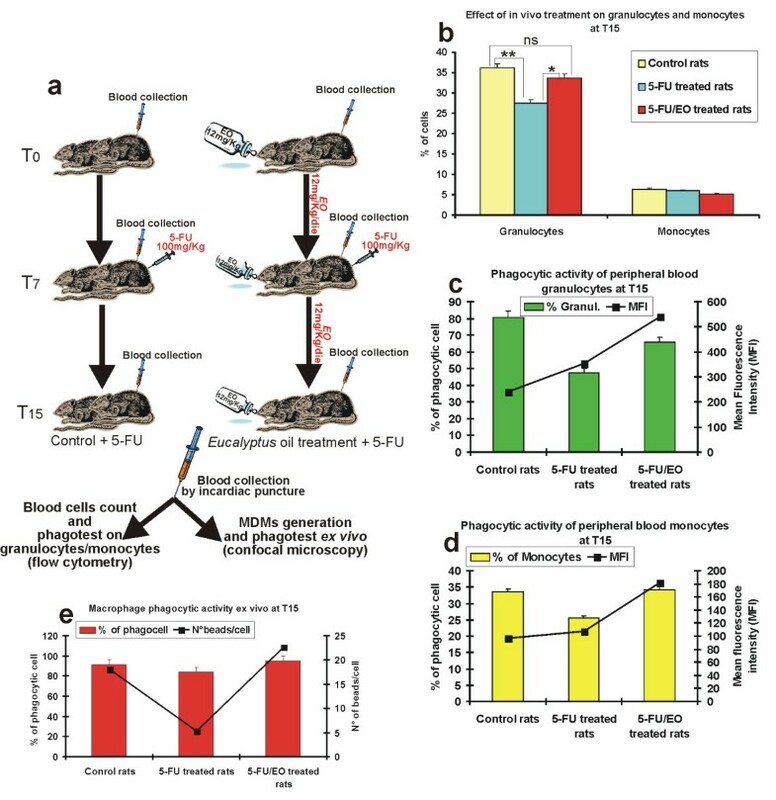 5-FU treatment also induced a decrease of phagocytic activity of peripheral blood granulocytes/monocytes, but in E O/5-FU treated animals the granulocytes/monocytes phagocytic ability was restored to values near to that of untreated immuno-competent rats (Fig. 8c, d). Finally, the ex vivo experiments revealed that the recovery of phagocytic activity was also present in differentiated macrophages obtained from 5-FU/E O treated animals, compared to rats treated with 5-FU alone (Fig. 8e). Some biological effects of Eucalyptus oil (E O) extract such as its antiseptic properties against a range of microbial agents [6, 7] and, recently, its anti-inflammatory potential, both in vitro [15, 24] and in vivo [16, 17, 25], mainly concerning the effect on some cytokine production, have been demonstrated. However, rather little is known about the influence of this essential oil on the cellular components of the immune system, and in particular on the monocytic/macrophagic system constituting one of the primary cellular effectors of the immune response against foreign particles and pathogen attacks. In this study we present findings indicating that E O from Eucalyptus globulus is able to induce morphological and functional activation of human MDMs in vitro, dramatically stimulating the phagocytic response of these effectors of the innate immune defence. The acquisition of morphological features of E O activated macrophages and the increased phagocytic ability is coupled to a low release of IL-4, IL-6 and TNF-α pro-inflammatory cytokines, in contrast to that recorded under LPS stimulation. The differences in LPS- or E O-induced cytokine production were associated with differences in the cytoskeletal elements that mediate phagocytosis, since E O-stimulated internalization requires integrity of the microtubule network, while LPS-stimulation does not. This suggests, almost preliminary, that LPS and E O might act by means of different mechanisms, possibly involving different phagocytic receptors. It is actually known that internalization by macrophages occurs by a restricted number of phagocytic receptors present on their surface . Specifically, infectious agent are mainly phagocytosed by complement receptors (CR), after relatively non specific opsonization with complement, and by Fc receptors (FcR) after specific opsonization with antibodies. Important differences in the molecular mechanisms underlying phagocytosis by these two different receptors are actually recognized. These include differences in the cytoskeletal elements that mediate ingestion, differences in vacuole maturation, and differences in inflammatory responses. In particular, FcR-mediated phagocytosis is tightly coupled to the production and secretion of pro-inflammatory mediators such as cytokines and reactive oxygen intermediates , while CR-mediated phagocytosis is not. Furthermore, only the CR-mediated internalization requires integrity of the microtubular network . On this context, our data indicate that E O might implement pathogens internalization stimulating the CR-mediated phagocytosis. E O-induced implementation of innate cell-mediated immune response, coupled to reduced production of pro-inflammatory cytokines and toxic oxygen intermediates, might have profound implications for the inflammatory response during pathogen infections. 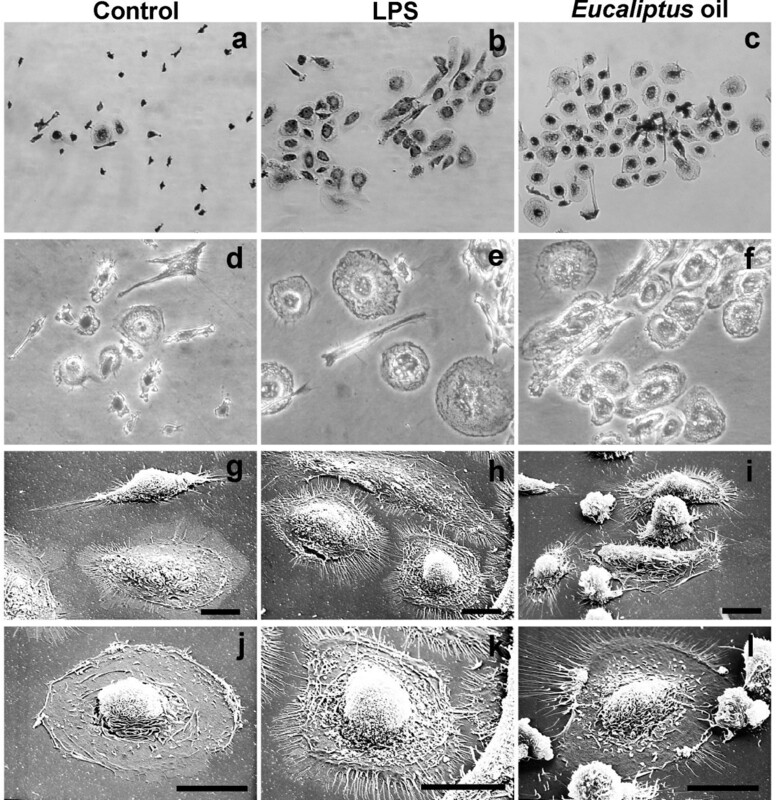 The presence in the E O treated cultures of numerous phagocyting polarised cells, exhibiting elongated lamellopodia and filopodia, indicates that stimulation of pseudopodial activity and cell motility might contribute to the augmented phagocytic capability. The in vitro stimulatory effect was achieved using concentrations of the essential oil ranging from 0.008% and 0.016% (v/v), doses that resulted absolutely non toxic and up to 100 fold lower than those used in vitro by other authors [24, 29]. Implementation of innate cell-mediated immune response has been observed not only in in vitro experiments but also in treated BDIX rats after 15 days E O administration. The stimulatory effect in treated animals, mainly involving the peripheral blood monocytes/granulocytes, led to a raise in the percentage of circulating monocytes as well as to an increment in the phagocytic activity of granulocytes and mostly of monocytic cells. These latter cells also exhibited an enhanced potential of extravasation ability, as suggested by increased expression of CD44 on their cellular membrane , as well as characteristics of activated monocytes [19, 20], as indicated by the higher percentage of CD25+ cells in circulating monocytes, compared to the untreated control rats. The stimulatory effect on phagocytic ability recorded in circulating monocytes was also retained in monocyte-derived macrophages from treated animals, as showed by the ex vivo experiments. The E O dose used in the in vivo experiments (12 mg/Kg/die) did not produce evident toxic effect on treated rats, as suggested by the lack of body weight reduction and of animals mortality. This dose was comparable to doses recommended for oral therapy in humans and much more lower than dose that have been described to exhibit sub-acute toxicity in rats (about 300 mg/kg/die) . Besides the effect of E O on the cell-mediated immune response in immuno-competent rats, this essential oil is also able to induce a dramatic recovery of granulocytes/monocytes activity after bone marrow suppression produced by 5-FU administration. In fact, combined treatment 5-FU/E O not only inhibited myelotoxicity, as resulted by the restoration of granulocytes number to normal values, but also raised the phagocytic activity of granulocytes and monocytes as well as of the ex vivo analyzed monocyte-derived macrophages, significantly decreased in animals treated with the chemotherapic alone. Since myelosuppression continues to be a major dose-limiting side effect for most chemotherapeutic agent such as 5-FU , our results suggest that the combination of E O with 5-FU might be taken into account for the prevention of immunotoxicity and myelotoxicity caused by 5-FU administration, even if additional studies should be carried out to demonstrate that the antitumor activity of 5-FU is not influenced by this combined therapeutic strategy. Moreover, further experiments are in progress to determine whether the immuno-stimulatory effect, observed both in vitro and in vivo, could be due to the major monoterpenoid component eucalyptol (1,8-cineole), constituting the 60–90% of Eucalyptus oil , or is related to its synergic cooperation with the other minor components present in the crude extract; preliminary results seem to be indicative of this later hypothesis. Most knowledge of the therapeutic use of plant essential oils is acquired through folklore, and only some activities of these natural extracts are actually supported by scientific studies. But plants are an important source for drug discovery, and investigations on biological actions of plant medicinal extracts, as well as the understanding of the mechanisms underlying these actions drive the search for novel drugs. Overall, our data, demonstrating that Eucalyptus essential oil from Eucalyptus globulus is able to implement the innate cell-mediated immune response, provide scientific support for an additional use of this plant extract, besides those concerning its known antiseptic and anti-inflammatory properties. Thus, the present study stimulates further investigations also using single components of essential oil extracts from various species of Eucalyptus for development of a possible new class of immuno-regulatory agents useful as adjuvant in immuno-suppressive pathologies, in infectious disease as well as in tumour chemotherapy. Peripheral blood mononuclear cells (PBMCs) were isolated from buffy coats of healthy donors by density gradient centrifugation using Lympholyte-H (Cederlane, Hornby, Ontario, Canada). The lymphocytic/monocytic fraction was then re-suspended in RPMI 1640 medium (Hyclone Labs Inc. Logan, UTAH) supplemented with 10% (v/v) heat-inactivated fetal calf serum (FCS) (Hyclone), L-glutamine (2 mM), penicillin (100 IU/ml) and streptomycin (100 mg/ml) and cells were seeded on 175 cm2 flasks and maintained at 37°C in 5% CO2, to generate adhering MDMs. After 1 h of culture, non-adhering cells were removed and the residual adhering MDMs were maintained in culture for 7 days to obtain partially differentiated macrophages. At this time, cells were detached using cold PBS, seeded at a density of 2.5 × 104 cells/cm2 in 35 mm culture plates or on cover-slips (∅ 10 mm) and allowed to adhere for 4–5 days before treatments. Essential oil from Eucalyptus globulus was purchased from Cruciani Prodotti Crual® Srl, (Rome, Italy). To exclude that the oil preparation used contained any endotoxins, we tested the E O extract using the Limulus Amebocyte Lysate (LAL) test (PYROGENT. Plus – Lonza Walkersville, Inc., Walkersville MD) The LAL test is a qualitative test for Gram-negative bacterial endotoxin utilizing a lysate prepared from the circulating amebocytes of the horseshoe crab (Limulus polyphemus) standardized to detect the labelled concentration (EU/ml) of the FDA Reference Standard Endotoxin. Limulus Amebocyte Lysate was mixed in equal parts with the solution being tested and incubated 1 h at 37°C. In the presence of endotoxin, a positive reaction is characterized by the formation of a firm gel; in the absence of endotoxin, gelation does not occur. The assay was done as a yes/no test. The EO samples and controls were diluted in sterile water, performed in triplicate and run in parallel. Positive controls consisted in 2 ng/ml (1 EU/ml) E. coli Control Standard Endotoxin or 0.1 μg/ml LPS; negative control consisted in sterile water. The LAL test excluded that the E O extract contained any endotoxins. (see Table S1 in the additional file 4). Human MDMs were treated with 0.008% v/v in RPMI 1640 medium (corresponding to about 50 μg/ml) or 0.016% v/v (about 100 μg/ml) of Eucalyptus oil (E O) for 24 h. Concentrations were selected on the basis of the lowest, non toxic, effective doses found in a preliminary dose-response experiment (see Additional file 1). Cell viability after E O treatment was determined by the Trypan blue dye exclusion method. MDMs stimulated with 0.1 μg/ml of bacterial lipopolysaccharide (LPS, Sigma-Aldrich Co., St. Louis, Mo, USA) for 6 h were used as positive control of macrophage activation. The effect of E O 24 h pre-treatment before stimulation with LPS was also analysed. Essential oils from Lavender oil and the Tea Tree oil (Cruciani Prodotti Crual® Srl), were used as controls to exclude a non specific effect on macrophages phagocytic activity caused by the oil preparation. For any microscopic analysis cells were grown on cover-slips. Analysis of morphological feature of activated MDMs, was carried out by phase-contrast microscopy after Wright Giemsa staining and by scanning electron microscopy (SEM). For SEM observation, MDMs were fixed with 2.5% glutharaldehyde in 0.1 M Millonig's phosphate buffer (MPB) at 4°C for 1 h. After washing in MPB, cells were post-fixed with 1% OsO4 in the same buffer for 1 h at 4°C and dehydrated using increasing acetone concentrations. The specimens were critical-point dried using liquid CO2 and sputter-coated with gold before examination on a Stereoscan 240 scanning electron microscope (Cambridge Instr., Cambridge, UK). The phagocytic activity of treated and untreated MDMs was tested by adding to cultures 2 × 107 beads/ml of yellow-green fluorescent polystyrene beads (∅ 1 μm, at a ratio of at least 10 beads/cell) with excitation/emission wavelengths of approximately 495 nm/515 nm (Molecular Probes, Inc., Eugene, OR). After 30 min, cells were fixed with paraformaldehyde, counter-stained with 1 μg/ml propidium iodide (PI – Sigma-Aldrich) and observed by the confocal microscope LEICA TCS SP5 (Leica Instruments, Heidelberg, Germany). The excitation/emission wavelengths employed for PI staining were 568 nm/590 nm. A minimum of 500 cells per sample were observed, the number of phagocytic MDMs (reported as percent of phagocytic cells), as well as the number of beads per cell, were counted. MDMs subjected to beads administration and maintained at 0°C to block internalization, was used as negative control of uptake. Quantitative assessment was done in a blinded fashion. The experiment was repeated three times and the mean values were plotted. We analyzed at least 20 buffy coats from different healthy donors. The concentration of IL-2, IL-4, IL-6, IL-10, TNF-α, and IFN-γ secreted into the culture media by human macrophages after in vitro E O treatment were determined by using the BD Cytometric Bead Array human Th1/Th2 cytokine kit (BD Pharmingen) according to the manufacturer's protocol . Flow cytometry analysis was carried out using a FACSCalibur flow cytometer (Becton Dickinson, Mountain View, CA). The effect of E O pre-treatment on the pro-inflammatory and immune modulating cytokines production by macrophages stimulated with LPS was also evaluated. To depolymerize microtubules, control cells and macrophages, pre-treated with LPS or E O, were treated with 2 μg/ml nocodazole for 30 min. 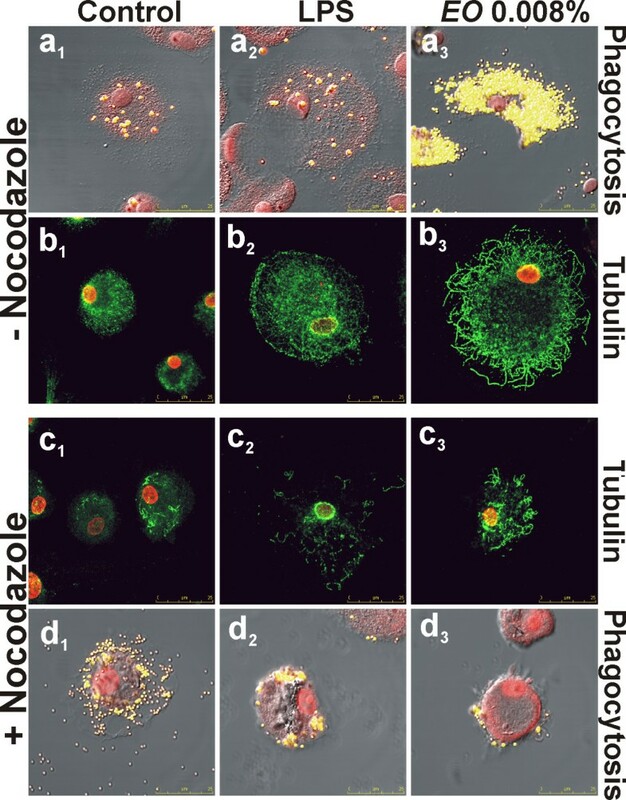 For phagocytic activity testing, after nocodazole treatment, fluorescent polystyrene beads were added to the cell culture, samples were processed as described above and analysed by confocal microscopy. The effect of nocodazole on microtubular network was analysed after immuno-staining, using an anti-human tubulin mouse monoclonal antibody (Molecular Probes) revealed with the secondary Alexa Fluor 488-conjugated anti-mouse IgG (Molecular Probes), by confocal microscopy. Cells were counter-stained with PI (Sigma-Aldrich). Inbred male BDIX rats (Charles River, Calco, Italy), 8 weeks old and weighing 220–250 g, were held for 7 days, housed in a pathogen-free animal facility with free access to water and standard food and kept in accordance with European Community guidelines. Experiments were approved by the local committee on animal experimentation, and were performed under strict governmental and international guidelines. E O was administrated for 15 days per os, at a dose of 12 mg/Kg/day, by adding, every evening, the essential oil extract directly to drinking water (7 μl/day of essential oil per animal). Two sets of in vivo experiments were carried out. In the first one, in which we tested the effect of E O on peripheral blood mononuclear cells of immuno-competent rats, animals were divided in two groups (12 animals/group), an untreated control group and a group treated for 15 days with E O (see schematic diagram in Fig. 6a). In a second experiment, in which we tested whether E O treatment could be able to induce a recovery of peripheral blood mononuclear cells activity after bone marrow suppression, rats of both groups (12 animals/group) were intra-peritonally injected with a single dose of 100 mg/Kg of the chemotherapeutic agent 5-fluorouracil (5-FU) on day 7 from the beginning of E O treatment (see schematic diagram in Fig. 8a). In both sets of experiments, from all animals, anaesthetized by inhalation of 2-bromo-2-chloro-1,1,1-trifluoroethane (Fluka, Sigma-Aldrich), blood was collected, by intracardiac puncture, before treatment (day 0 – T0), on day 7 (T7), on day 15 (T15) and on day 20 (T20). For evaluation of haematological parameters, after erythrocytes lysis by FACS Lysing Solution (Becton Dickinson), mononuclear cell fractions in RPMI 1640 medium were analyzed for forward (FSC) and sideward (SSC) scatter patterns in a fluorescence-activated cell sorter (FACScan, Becton Dickinson). Gates were defined to identify populations of cells with different FSC/SSC characteristics, corresponding to granulocytes, lymphocytes or monocytes populations and results were expressed as percent of total cells. In addition, rat peripheral blood mononuclear cells (PBMCs) were isolated by density gradient centrifugation using Lympholyte-H (Cederlane, Hornby, Ontario, Canada). The lymphocytic/monocytic fraction was then re-suspended in RPMI 1640 medium and rat adhering macrophages were obtained as described previously for human MDMs and used for the ex vivo experiments. The evaluation of phagocytic activity of monocytes/granulocytes from peripheral blood of BDIX rats, after in vivo EO administration, in absence or in presence of bone marrow suppression by 5-FU administration, was carried out by cytofluorimetric analysis using the phagotest kit (ORPEGEN Pharma, Heidelberg, Germany), following the manual's protocol. This test allows the quantitative determination of leukocyte phagocytosis in heparinized whole blood. It contains fluorescein (FITC)-labelled opsonized bacteria (E. coli-FITC) and necessary reagents, and measures the overall percentage of phagocytic monocytes and granulocytes (that have ingested one or more bacteria per cell) and the individual cellular phagocytic activity (number of bacteria per cell) recorded as Mean Fluorescence Intensity (MFI). The phagocytic activity of rat MDMs, obtained from treated and untreated animals and grown on cover-slips, was evaluated ex vivo by confocal microscopy after fluorescent beads administration, as previously described for the in vitro experiments on human MDMs. To test the phagocytic ability towards microbial pathogens, MDMs from treated and untreated immuno-competent animals were subjected to an in vitro infection with a suspension of Staphylococcus aureus (1 × 105bacteria/cell), and observed after 6 h of culture by confocal microscopy. The expression of CD44 and the percentage of CD25+ cells in circulating monocytes from treated and untreated rats were evaluated by cytofluorimetric analysis. Living cells were incubated with a mouse anti-rat CD44H (clone OX-49; BD Pharmingen), detected using a PE-conjugated polyclonal anti-mouse IgG (BD Pharmingen) or with a FITC-conjugated mouse anti-rat CD25 (clone OX-39; BD Pharmingen), using a FACScan flow cytometer (Becton Dickinson). For statistical analysis the two-tailed Student's t test was used. For the in vitro evaluations, at least three independent experiments have been carried out and data are given as the mean ± SD. For the in vivo and ex vivo experiments, results are reported as mean of 12 animals/group ± SD. For all analyses, significance was calculated with a P value < 0.01. The authors would like to thank Rossana Psaila Ph.D for her precious assistance in macrophage cultures maintenance and treatment, Dr. Paolo Daniele Siviero for his advises about the Intellectual Property Right, Martino Tony Miele for linguistic styling of the manuscript and Mariangela Rasi for her secretarial assistance. This work was partially supported by National Research Council, INMM-ARTOV. AS conceived of the study and designed the experiments, carried out all microscopic analyses, collected and interpreted data, drafted the manuscript. PSV has been involved in drafting the manuscript and revising it critically. FA performed the macrophage cultures and treatment, carried out preparation of samples for confocal and electron microscopy observations, participated in the in vivo study. MZ carried out the in vivo study, and the preparation of samples for cytofluorimetric analysis, participated in the macrophage cultures maintenance and treatment. LM participated in the in vivo study, and in the macrophage cultures maintenance and treatment. MF participated in the design of the study and has been involved in revising the manuscript critically. GR has been involved in drafting the manuscript and revising it critically. EG has been involved in revising the manuscript critically. PP participated in the design of the experiments, carried out all cytofluorimetric analysis, and has been involved in drafting the manuscript and revising it critically.